Buon giorno. Don't let atheists tell you that they do not have a religion. Although atheism itself is a religion in its own right, "science" has practically become an object of worship. Atheists are especially fond of science when they conflate it with evolution so they can get out of the problem of where life came from and how it allegedly evolved on the Earth. But regular observable science is one thing, and historical science is quite something else, capice? 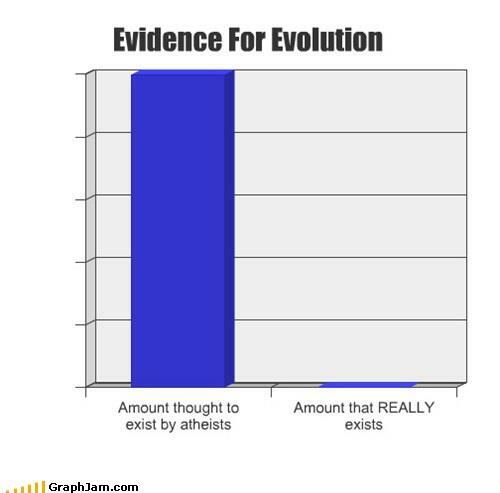 Those of us who do not believe that the facts support evolution do not "hate science"; that accusation is sneaky and disingenous. It also shows the lack of logic in the accuser's thought processes. I’m getting some hits regarding scientism but don’t actually have any posts dedicated to it. I thought if I’m going to be looked at on the subject I should make at least a few deliberate comments. They should not be construed, however, as exhaustive. Scientism can refer to a few different ideas and I denounce them all. It goes without saying that people who exhibit ‘scientism’ would not use the word to describe themselves and they will resent the suggestion that they are as described. Read the rest of this excellent article, "Scientism: The Atheist’s Religion of Faith", here, Hans. Buon giorno. It's time for another rant. Some people miss my rants. This one outta hold ya for a while!I don't get it. This Constitutional Representative Republic were I live called the United States is getting weird. On one hand, we have people wanting total democracy. "Majority rule" is mob rule. Do not want. On the other hand, what we are supposed to be living with is great, and it works. Or it used to. Special-interest groups spoil things for everybody. We have atheo-fascists like the "Freedom from Religion Foundation", "Military Association of Atheists and Freethinkers" ("freethinkers", that's a laugh based on a genetic fallacy) and similar weasels protesting practically everything in public life that even resembles and "endorsement of religion". United States Marines put up a cross to honor the fallen. Losers have to protest it. Makes me believe we're devolving into lower life forms, capice? Want to outlaw something you don't believe in? How about unicorns! Get all references to them removed from school textbooks. Then, go after leprechauns! And the Norse gods! You believe in the intellectually bankrupt "goo-to-you" evolutionism and try to outlaw competition to that view, may as well go after mythology.That is, if you can sober up long enough to do something. Or get jobs where you actually contribute something to society instead of trying to make life miserable for the majority. Atheists are about four percent of the population, but want to ruin things for everyone else. Leave it alone. Get lives. They claim to be offended. Wusses. I'm with Brad Stine on this: "Know what offends me? Offended people!" People use political correctness as a weapon to stifle free speech and trample the rights of others. In another area, Starbucks decided to stop using a dye made from crushed beetles because it annoyed the vegans. I'm not all that fond of learning that bug juice may be in my foods, but oh well. How many vegans are there, anyway? About three percent of the population claim to be vegetarians, and about a third of those are vegans. They think their numbers are sizable enough to pressure food vendors across the country. I have a Starbucks gift card that is five years old, so I am not exactly a frequent customer. Anyway, I do have some sympathy for them. People are skittish about the miracles of modern chemistry in their food, so the food dye must be natural. Ground up beetles are natural, right? But no, some people don't like beetle juice. Starbucks can't win, it seems. Both cases have a loud minority making people change to cater to their whims. The first is religious bigotry, the second is business. Starbucks can cave in to the whims of the small minority. So can other businesses. That's right, I said it! It is business. They have the choice. People have the right to fight injustice. Businesses have the right to fight pressure, or to give in, whatever they decide.But I think that letting the minority groups make the rules for the rest of us, like the misotheists and leftist courts are doing, encourages businesses to fear the minority. Buon giorno. It's time for a spot of fun. I'm going to speculate and play with words. "What's with the Samhain, boss? We're nowhere near Halloween." Because it's not actually a Halloween post, Ernie. Hey, where's Nicky? "Him and Lela went to see that guy about that thing you told them to." 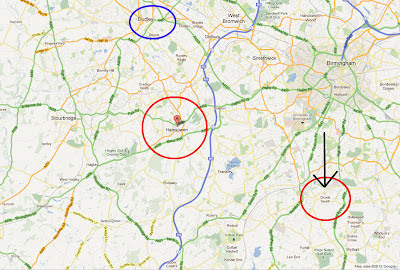 Annotated screenshot of a Google map. Click for larger. Quite a few people don't know that "Samhain" is not the name of the guy in the billiards parlor. It's an important occultists' holiday (witches, druids, Satanists and that sort of thing), and is most commonly pronounced SOW-en. Here, pig pig pig! Another pronunciation is so (long "O", as in "So what?") -WEEN. Best wishes with those. 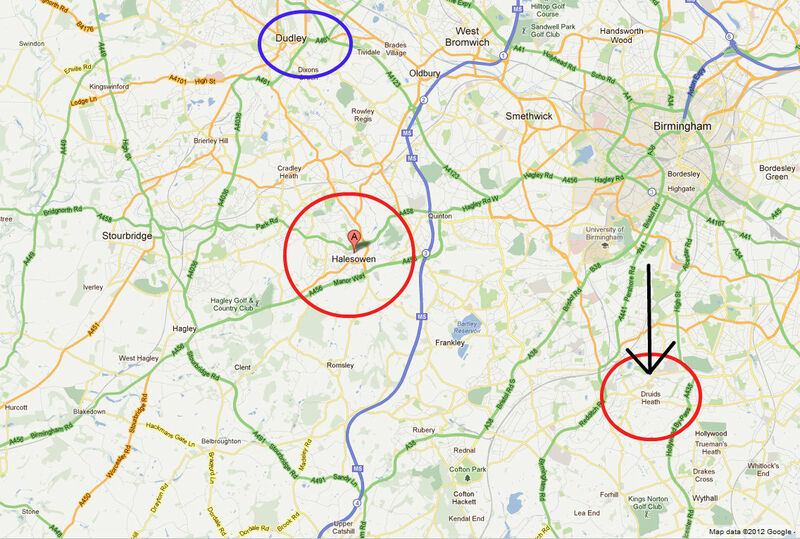 The city in the map is Halesowen. It also has an odd pronunciation, sounds like "Hail Zowen". Blending the Celtic pronunciations on Samhain to get SO-wen, and you can get "Hail, Samhain" out of it. Hail Satan. Which is fitting, since it's not all that far from Druid's Heath. I can easily picture a drunken narcissistic Brit atheist mumbling "Hail SO-wen" as he tries to find an Internet connection so he can spew his bile for his dozen adoring but mindless fans. (Another of my speculations is that atheism is another form of Satanism, so it's fitting for him to say, "Hail Samhain", speech slurred by cheap rum.) If he cannot find a Wi-Fi hotspot, he begs people for a place to recharge his Mac and to access the Internet. This does not last long, as nobody can stand him for more than a few hours. You see, he lives in his auto because after being evicted from several flats in a short span of time, nobody wants to rent to him. That, and because he is unemployable due to outbursts of extreme rage. Would you hire or rent to someone like that? He's high-risk for your reputation. And for your safety, capice? Don't let hate destroy your thinking, kids. Addendum: I've long said that this kind of atheist has no sense of humour, unless s/he is mocking Christians, God, Jesus, the Bible and so on. But like I keep saying, I think that atheism causes brain damage. Case in point: It's reported to me that someone took exception to my story here. Worse, this guy claimed that it was about himself. Again. (In a previous post, I talked about someone who was left nameless. Then, he and his wife came along and identified themselves in the then-existing comments!) This is the intellectual elite? Not bloody likely.